May 05, 2008 by Alphageek in "President's Park Williamsburg bourbon washington"
Mrs. Alphageek and I stopped on the way back from Nags Head, NC. We had a great time doing pretty much nothing. We were still somewhat disappointed that we did not get to see the World's Oldest edible ham. Ok, so it was me that was disappointed. Mrs. Alphageek was just going along for the ride. I think Mrs. Alphageek took pity on me and agreed to make another try at uncovering some more bourbon history. We stopped outside Williamsburg, VA to visit Presidential Park. Presidential Park is a tourist stop the way a tourist stop should be. Something that you won't see anywhere that is sort of neat, but makes you laugh a little at the same time. We drove up and there are heads everywhere. 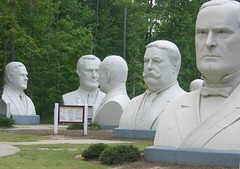 The heads are busts of the Presidents of the United States. We took some pictures that are on the flickr account if you want to take a look. While there, we learned that President Washington had an important connection to the Whiskey Rebellion, for those of you non-geeks that have forgotten their history. If you are further interested, I have set up a link where you can read all about it. What else would you expect the Alphageek to do? Mrs. Alphageek and I walked around for about an hour and a half and looked at all of the heads. We also took a quick look at an Air Force One mock up that was at President's Park as well. We left feeling that President's Park is not something you see everywhere. Is that a good thing? We will let you find out when you stop by this exciting piece of America. "President's Park Williamsburg bourbon washington"